The head of the House Democrats' re-election campaign and several Congressional Hispanic Caucus members have continued to appear at fundraising events with Rep. Tony Cardenas (D., Calif.) months after a lawsuit was filed alleging that he drugged and molested a 16-year-old girl in 2007. An Instagram photo montage of a July 18 fundraiser for BOLD PAC, which Cardenas heads, shows Cardenas standing with several members of the Hispanic Caucus, including Democratic Congressional Campaign Committee Chairman Ben Ray Lujan (D., N.M.), as well as Reps. Ruben Gallego (D., Ariz.), Nanette Barragan (D., Calif.), Lucille Roybal-Allard (D., Calif.), and Salud Carbajal (D., Calif.). Democratic Congressional Campaign Committee Chairman Ben Ray Lujan (D., N.M.) is speaking at a podium in one of the photos. "Great to spend some time with several members of the @hispaniccaucus @boldpac and can't wait to welcome several members after the #bluewave in November," wrote Cristina Antelo, who serves as the Congressional Hispanic Caucus Institute vice chair, on her Instagram account. Lujan on Sept. 27 tweeted his support for Christine Blasey Ford in coming forward and sharing her allegations against Kavanaugh. "Dr. Christine Blasey Ford demonstrated incredible bravery in sharing her story before the Senate Judiciary Committee today," he tweeted. "I have joined my colleagues in calling on Senate Majorioty Leader McConnell to immediately postpone any proceeding on Judge Kavnaugh's nomination until the FBI fully investigates the multiple serious and disturbing allegations against Judge Kavanaugh," he tweeted the same day. The DCCC did not respond to a Washington Free Beacon inquiry asking why Lujan has not expressed similar deep concern about the serious molestation charges Cardenas is facing and why he continued appearing with him at fundraising events months after the woman filed the lawsuit against Cardenas in late April. Minority Leader Nancy Pelosi (D., Calif.) and Minority Whip Steny Hoyer (D., Md.) 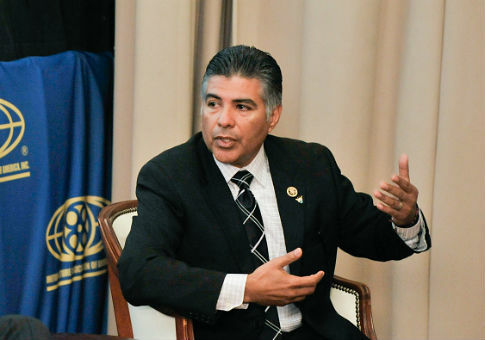 in May called for an Ethics Committee investigation into the allegations against Cardenas, which has yet to publicly announce a probe. Cardenas's attorney denied the charges in a statement to the Washington Post in May. Members of the Hispanic Caucus have been mum on the issue, although Rep. Michelle Lujan Grisham (D., N.M.), who chairs the Hispanic caucus, has reportedly privately relayed concerns to Cardenas about the lawsuit and the allegations, although she has not asked him to step down from running the PAC. Amid the national firestorm over Kavanaugh's confirmation and the Blasey Ford accusations, Republican candidates for Congress have started calling on their Democratic opponents to return donations from BOLD PAC in light of the sexual assault allegation against Cardenas. Earlier this week, Justin Fareed, a GOP candidate challenging Carbajal in a district along the Central California Coast, called on Carbajal to return $20,000 in donations from BOLD PAC, $10,000 of which the congressman took on March 27 of this year, a month before the molestation lawsuit was filed. "The bottom line is that accepting funds from BOLD PAC shows [Carbajal's] tolerance of the alleged despicable acts [allegedly] committed by its chairman," Fareed's campaign said in a press release. "Salud Carbajal portrays himself as a protector of women's and survivor's rights while at the same time benefiting from those dirty funds," Fareed said in a statement. "Salud has been aware of these credible, disturbing allegations against Tony Cardenas since they came to light in may but has refused to comment and kept the money." "He should, at the very least, immediately return the $20,000 he's received from BOLD PAC," he added. The Carbajal campaign did not return a request for comment. Several other Democratic candidates for Congress in key battleground seats also have not responded to the Free Beacon‘s questions on whether they will return the BOLD PAC funds. Those Democratic candidates include: Jason Crow in Colorado, as well as California Democratic candidates Mike Levin, Katie Hill, Ammar Campa-Najjar, and TJ Cox. A woman identified in court documents only as "Jane Doe," who is now in her twenties, accused Cardenas of drugging and fondling her when she was 16 years old and a rising golf star. The woman filed a lawsuit against Cardenas in late April. A Los Angeles Superior Court judge ruled in late September that the woman could amend her complaint to add new facts and an allegation of negligent infliction of emotional distress.